How's that saying go? "Everything old is new again." It's absolutely true when it comes to finished basements. Some of you may remember when that paneled room with the ping pong table in the middle was called a "Rec Room." It was always a great space for the kids to have their friends visit or the perfect spot to store the old furniture. Today's finished basements take innovation to a new level. These areas are seeing high-tech media rooms, state-of-the-art home offices, private bedroom suites with a fully appointed adjoining bathroom, or any other multi-purpose bonus rooms. The main differences between the vintage Rec Room and today's amenity-filled lower level is the cost. While a flooded basement in the old days would have been a great inconvenience, such an event today could mean the loss of thousands of dollars. Therefore, it's vital that you prepare a plan for waterproofing the area well before you begin the renovation work. You'll want to make sure your basement isn't retaining moisture and is structurally sound even before you start the design process. A simple condensation test can be done by taping 2-foot pieces of plastic on the floor and walls. If after a couple of weeks, the bottom side has formed water droplets, you'll need to seal the concrete. If the top is wet, run a dehumidifier to dry the air. Check for spongy wood in floor and header joists, sill plate and windows. Look for dark spots or deterioration and probe the area with an awl. If it goes in easily, you'll need extra support there. Sagging floor joists can also be a concern, especially when trying to install a drop-ceiling. Stand on a ladder at eye level to the underside of the beams. You'll be able to see any out of line by looking across them. Professional inspection of your furnace, hot water heater and ventilation system will ensure there's no carbon monoxide buildup. Many building codes require a height of 7 to 7-1/2 feet. If you need more room, you may be able to relocate ductwork or pipes. 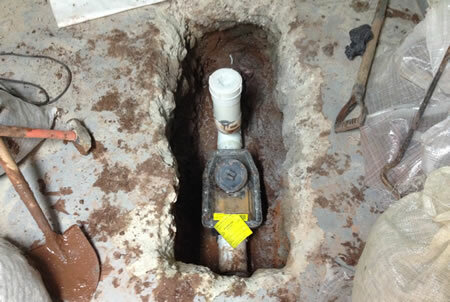 More extensive underpinning or digging out and lowering the basement floor may be necessary. This is a job for a professional. It can be costly but definitely something that is possible. Yes, that's plural - as in, you'll need a battery backup for your main pump to protect your finished space, in case of a power outage; and a second pump, in case the first one breaks down. As the sump pump will likely be hidden away in a utility room, you should probably also invest in sump pump alarm or high water alert system. These are all fairly inexpensive devices that could avert disaster. You can handle minor leaks without a contractor, so don't ignore them. Use concrete-patching compound to seal small cracks. Larger ones can be fixed with hydraulic cement. This works well as it expands as it dries. Anything more than 1/2" wide should really be inspected by a professional waterproofing company or a structural engineer. Applying waterproof paint to the concrete walls will give an added layer of protection behind the insulation. Make sure the soil slopes away from the foundation. Settling and gutter overflow can change the original grade and allow water to lie along the basement walls. To further help reduce this risk, install 10-foot diverters that take the roof water away from the house. To prevent condensation from dripping off your cold-water pipes and inside the drywall or ceiling, cover them with foam insulation before boxing them in. Use them over hot-water pipes to stop heat loss too. If your basement windows are below grade, you'll definitely want window wells to prevent water infiltration. Corrugated metal do the job, but you may want to consider an upgrade with fiberglass or stone-look material. They'll provide a much better view from your new basement retreat. Grates or clear plastic covers will prevent dirt and debris buildup, but make sure they come off easily for emergency egress. Ok, now you've got the prep work done, and it's time to start laying out the new room. Regardless of use, there are a few elements that will help make this the most popular place in the house. Draw people in by placing the main social spot in the sunniest area. People will radiate toward the natural light so make sure there's plenty of seating. In contrast, the TV will be best situated in a darker area. This will reduce glare and be the perfect environment for a home theater. Don't forget that you'll need a window for egress in any bedroom area. That means the room needs to be set up along an outside wall. Store snacks and beverages in a central location so everyone can access them without blocking the TV or disturbing private time. There are a few construction material options for do's and don'ts. First, don't use fiberglass insulation against the concrete wall. Concrete holds water and water vapor for years. Water vapor leaves the concrete as it dries and will try to break through the insulation and wall. Fiberglass insulation will trap moisture and cause serious mold issues. A better choice is closed cell spray foam or closed cell XPS foam board. These both provide an excellent vapor barrier and insulation value. Don't use standard drywall below grade. The paper coating will promote mold growth and the gypsum core is prone to crumbling. The best choices include below-grade, mold-resistant gypsum panels. For those wishing to save floor space and labor, interlocking panel systems are available. Panels fit together and are attached to the foundation walls with glue, clips or screws. Below-grade drywall is attached in between incorporated strips for a thinner wall. Time-saving channels for wiring and drainage are built into the back side. Be careful about how many walls you install, or you'll feel like you're in a maze each time you enter. Building half walls or window cutouts will help to open the rooms up and let in more light. Sliding doors can be a great idea as they can be closed for privacy. Remember to leave some work space around mechanicals and the sump pump. Clearance of 2 to 3 feet should be sufficient. Today's laminate flooring options include a variety of patterns and designs that mimic ceramic tile and hardwood. They are scratch- and moisture-resistant and installed with floating, tongue and groove system. Individual replacements can be made if boards become damaged. Most also come with a 20-year warranty for a lifetime of worry-free use. If you're looking for a softer surface that will deaden noisy feet in a play area, wall-to-wall carpeting will work well. Select something with synthetic fibers as they resist mold and mildew. You'll be amazed at the numerous selections for ceilings - from molded coffer to tin to room brightening to sound blocking. Most hang on a grid so you'll have easy access to plumbing and wiring. If you want extra soundproofing, add fiberglass batting without a vapor barrier. Lay them between the joists, fasten drywall with clips and metal furring channels. This will stop vibration and sound travel. Lighting is a critical component to your new finished space. Recessed cans are perfect for broadcasting light throughout the room. Space them close enough so dark spots are eliminated. Add dimmer switches and wall sconces to create a little atmosphere. Keeping the finished basement feeling warm and fuzzy will bring family and friends years of enjoyment. Use a separate thermostat, put registers at the floor instead of ceiling, and install electric baseboards as a supplemental heat source. A direct-vent gas fireplace will add some ambiance and warm up the space. The best part - no need to drag firewood downstairs. Areas rugs can be used to warm up a laminate floor or extra texture and softness to a carpet. They're inexpensive and will add a great design element to the room. There are a few waterproofing precautions needed when adding a bathroom to your basement. To prevent an overflow, install a backflow valve on the main drain. This will stop backups in sinks and tubs. Adding a humidistat to your exhaust fan will control excess moisture. A sewage ejector system should be used to handle wastewater properly. 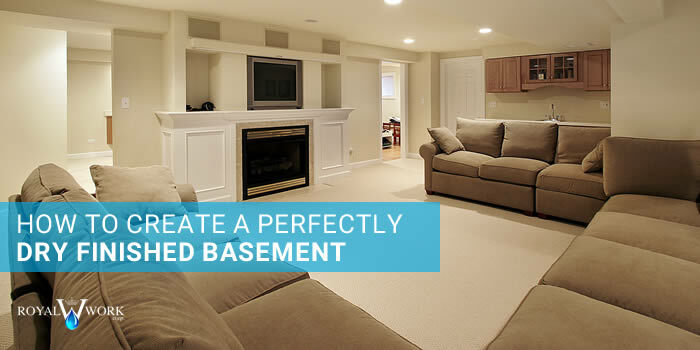 Finishing your basement makes perfect sense. You'll gain significant extra living space for a fraction of the cost of building an addition. Make sure you follow the guidelines listed to keep the space dry and moisture-free. If you have questions or need additional expertise, call Royal Work Corp. We'll help you reach your goals and keep your new basement space dry for years of enjoyment.